Make a saw handle - and you could win a £600 bespoke training course at one of the worlds finest furniture making studios! A 1 week bespoke cabinetmaking training course at Robinson House Studios with award winning designer maker Marc Fish. You choose which particular aspect of furniture making you would like to focus on, sharpening, drawing, hand planing, laminating, dovetails, mortice and tenon joinery, etc, and Marc will tailor the training to suit you. Marc may only make a handful of pieces a year, but each one is so exceptional and so different that the whole industry takes note. As well as exquisite furniture, the studio also produces some of the most promising faces of the next generation of designer-makers, including names you may recognise like Chris Funnel and Rhys Gillard. and we will send you a discount code giving you 15% off Continental hand stitched rasps, Atkinson Walker handsaw kits and African striped ebony saw handle blanks within the next working day. Once you have assembled all of the materials that you are going to use, send a photo of them (800 to 1000 pixels wide if possible) to the same email address. Send another photo of what it looks like halfway through, and then a third photo of the finished handle attached to the saw. All photos must be received by November 5th 2013 - remember, remember! The winning entry will be chosen by Marc and announced on November 15th. No purchase necessary, if you want to rehandle a saw that you already have - go for it. The sycamore for the handle in the photo above came from the firewood pile. This is purely a skills competition and entries will be judged on that basis alone. The prize includes your training at Robinson House Studio in Newhaven, Sussex. It does not include meals, accommodation or travel to and from. However if you need recommendations for places to stay, Marc will be happy to oblige. The course will take place on mutually convenient dates to be agreed between Marc and the winner. Workshop Heaven and Robinson House Studio reserve the right to use any submitted photos for marketing or other purposes. We may also add you to our email newsletter lists, don't worry, we are quite civilised and don't bombard you with 'deal of the day' (we hate that as much as you do) you will be invited to accept or decline and can unsubscribe at any time. Where entrants are referred to in accreditation or announcements it will be in the form 'Dave from Bedfordshire' or 'Dave R from Bedfordshire' (if we get two Daves from Bedfordshire). If we get two Dave R's from Bedfordshire we might have to call one of them David. If things don't go quite right with your handle and you want to start afresh, please feel free to do so. 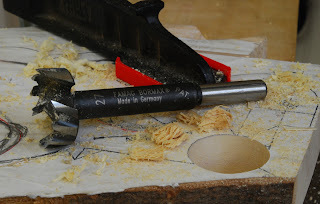 We're woodworkers too and we've all been there. Just email a photo of your new materials and carry on as before. Entry is open to all Woodworkers aged 16 and over. If you live outside the UK please be aware that if you win first prize you will need to get there under your own steam. 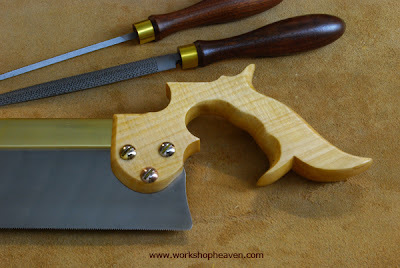 Entries can be handles for any hand saw (handsaw, dovetail saw, tenon saw etc) if you really want to do a gents saw handle - feel free, but please remember it is a competition to demonstrate your skill level.